The forest is filled with all sorts of monsters. They watched and waited as you built your castle and trained your soldiers, but now they've gathered their army and are marching out of the woods. 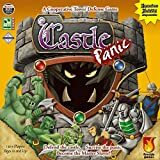 Can you work with your friends to defend your castle against the horde, or will the monsters tear down your walls and destroy the precious castle towers? You will all win or lose together, but in the end only one player will be declared the Master Slayer! Castle Panic is a cooperative, light strategy game for 1 to 6 players ages 10 and up. Players must work together to defend their castle, in the center of the board, from monsters that attack out of the forest at the edges of the board. Players trade cards, hit and slay monsters, and plan strategies together to keep their castle towers intact. The players either win or lose together, but only the player with the most victory points is declared the Master Slayer. Players must balance the survival of the group with their own desire to win. The forest is filled with all sorts of Monsters. Goblins, Orcs, and even mighty Trolls lurk in the shadows. They watched and waited as you built your Castle and trained your soldiers, but now they've gathered their army and are marching out of the woods. 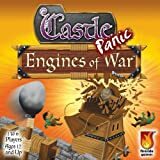 Can you work with your friends to defend your Castle against the horde, or will the Monsters tear down your Walls and destroy the precious Castle Towers? "Any Color" Archer, Knight, and Swordsman cards can hit Monsters in any color of their respective ring. Hero cards can hit Monsters in the Archer, Knight, or Swordsman ring of the color shown on the Hero card. Only Barbarian, Tar, and Drive Him Back! can affect Monsters once they are in the Castle ring. These cards have a symbol on them. When a Monster moves from the Swordsman ring and a Wall is present between the Swordsman ring and the Castle ring, the Monster attacks that Wall. The Wall is then removed from the board, and the Monster that attacked the Wall takes 1 point of damage. If the Monster still has points remaining, that Monster stays in the Swordsman ring until the next Move Monsters phase, as shown below. 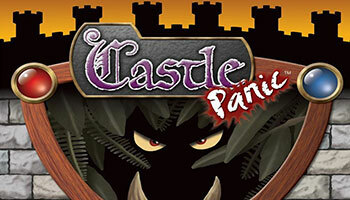 In the Co-op version of Castle Panic, players still work together to defend the Castle. They will all either win or lose as a team, but there is no Master Slayer. The rules are the same as the Standard game except players do not keep trophies of Monsters they have slayed. Instead, all slayed Monsters are placed into the Monster discard pile.